Chunky beaded necklaces are one of Curly's favorite things. There several places on Etsy to purchase them at $15-20. We thought we'd try to make one. 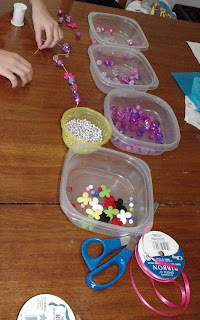 For about $20, we have enough beads to make several different necklaces. 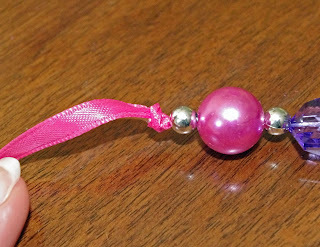 If you are looking to make just one necklace with a variety of colors, your best bet is to buy one on etsy. Otherwise, making your own is fun and frugal. 1. Cut the thread about 6" longer than your bead strand will be. Put a piece of tape on the non-needle end to keep the beads from running off. Arrange the beads in the order you'd like them. String them onto the thread. 2. Cut the ribbon in 1/2. Seal the end of the ribbon with heat or other means. Stitch the end of the ribbon securely and tightly to the bead strand. You don't want any thread space between your last bead and the ribbon. Do the same with the other side. 3. 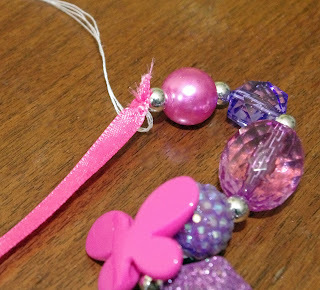 Tie the ribbon in a knot to hide the stitching. Heat seal the other ends of the ribbon to keep them from raveling. Enjoy your new chunky necklaces!!! They are great fun to create.